At the risk of losing my man card, I must confess that I watched The Shopping Channel a few weeks ago. In the 11 years that we’ve had satellite television, I have never, ever watched The Shopping Channel. Honest. But now, I can no longer make that claim. In my defense, I was channel surfing at the time and had no intention of stopping there but as I scrolled down the channel guide something caught my eye. Not only did I end up watching the hour-long segment but, after a discussion with SWMBO, I actually made a purchase. The segment featured Chef Wolfgang Puck hawking his Novo Pro pressure oven. I often watch a variety of cooking shows with my wife so I am well aware of the time saving advantages of pressure cooking. And I was certainly intrigued with an oven with that functionality. As the family cook (notice I don’t go so far as to call myself the family chef) I have long contemplated purchasing an additional counter top appliance to overcome the limitations of having only a single oven. Thanks to our kitchen renovation in 2009, we now have enough counter space for one. Needless to say, I was an easy sell for ol’ Wolfie. And so far I have been very happy with this purchase. I placed the order online at The Shopping Channel website on Friday September 26, 2014. The advertised price was $300. All-in cost for the oven, including shipping and Ontario taxes and a $20 pizza pan, was about $400. We chose to pay for the oven in 12 monthly installments which was another factor in our decision to make this purchase. I would have hesitated if not for this option. The taxes, shipping charges and the pizza pan had to all be paid with the first installment. The next 11 payments will amount to about $25 each. The oven arrived at our local post office on Tuesday September 30– 2 business days later! The (probably a little too long) video below shows me unboxing the oven. The oven arrived in excellent condition. Crumb tray: The tray is removable for easy cleaning and must be in place when using the oven. Ours had a slight bend, but I easily fixed that. Baking rack: Many reviewers point to the rack as one of the main weaknesses of the oven. While it is strong enough for a 5 pound roast and potatoes, it flexes too much under the weight of a turkey, which can cause the rack to dislodge and fall. One of the selling points of this oven is its ability to cook a 14 pound turkey but I am not sure if we would trust the rack to support that weight. The rack needs to be stronger and the supporting ridges inside the oven need to be beefier. Drip pan / Baking pan: I have not used this pan for baking, only to catch the juices when I cooked a rotisserie chicken. Broil rack insert: I have not used this item yet, so I cannot accurately comment, yet. But I can see a couple of broiled steaks in my future…. Roasting Pan: I’ve used this once, for a beef roast and vegetables. You can see that in the video as well. The pan appears to be good quality so far. The size is just under 10×14. The maximum size that will fit in the oven is 12×14. These sizes do not appear to be very common in the lower price ranges, but if you are willing to shop around and spend a few more bucks you can find them. Of course, smaller 9 inch accessories are a little easier to find. I love me some rotisserie chicken and being able to make it fresh at home was a huge selling point for me. The rotisserie rod can be used with the rotisserie tines for cooking whole chicken. I have done this and the result was amazing! The rotisserie basket slides onto the rod for air fried french fries, chicken wings or shrimp. I tried the french fries, but the rotating action of the basket combined with the rod going through the basket resulted in a lot of smaller broken pieces by the time they were ready. Another minor complaint is the two thumbscrews are used to secure either the tines or the basket to the rod. For the price point of this oven, one might expect an extra set of thumbscrews so that it wouldn’t be necessary to keep transferring them from one accessory to the other. Additional tools include a rack removal tool for removing the drip pan / baking pan, and a rotisserie rod removal tool to easily removes the rod from the oven. Design, fit and finish, etc. 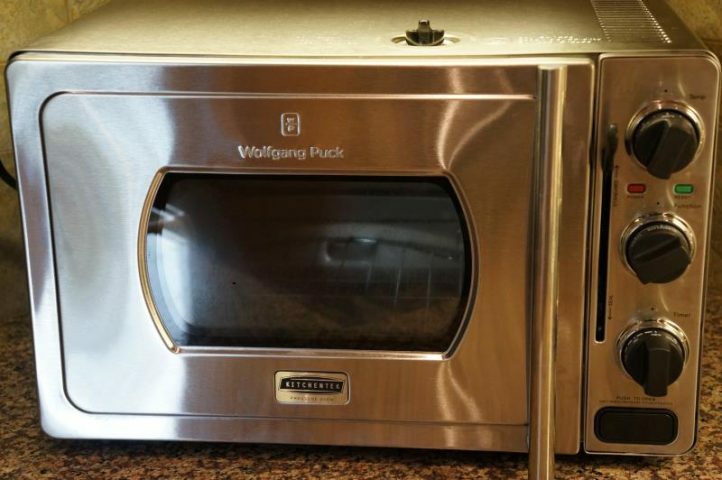 The Wolfgang Puck Novo Pro Pressure Oven somewhat resembles a large microwave oven in appearance. With a stainless steel finish, it looks like a professional quality appliance, which is what you’d expect at this price point. There are three large black control knobs– one to set the temperature (up to 450), one to select the function (bake, toast, roast, broil, rotisserie) and one to set the timer (up to 120 minutes, or “stay on”). Some critics complain that the knobs make the appliance look outdated. I suppose that is a matter of taste. Personally, I like the simplicity of the old-school design. Not everything needs to be digital. Of course, that means you won’t have the accuracy of digital controls but so far that hasn’t affected my results. The vent release valve on top of the unit can be set to either vent or seal. With the valve in the vent position and the sealing lever in standard position, the oven functions as a standard toaster oven. The magic happens when the valve and the sealing lever are both in the seal position. That’s what turns the oven into a pressure cooker. The vent release valve could be marked a little more clearly, so it is more obvious what position it is in. As a newbie, I did not know what to expect when using the oven in pressure mode. The valve will hiss as it rises up and down during cooking in order to maintain the proper pressure. The hissing caught me off guard and I and wasn’t sure whether the valve was properly seated or not. The top of the oven and the door get hot enough to cause burns. Nothing should be set on top of the unit or near the unit while it is in use. When using the oven in pressure mode, it is imperative that the pressure be released before opening the door. There is a lot of opportunity for serious injury if the safety precautions are not followed. Extreme caution needs to be exercised around this oven and every family member needs to be aware of the risks associated with the unit. Because hot steam is vented through the release valve, I move the oven out from under the cabinets before I use it (and resist the urge to move it back before it cools). Surprisingly, while the top gets dangerously hot to the touch, not much heat radiates from it. I don’t notice much heat buildup when the oven is under the cabinets. My main concern is that the escaping steam will damage the finish. At the time of this writing, we have had the oven operational in our kitchen for about a week and have used it three times. Roast beef and vegetables: A 3 pound roast with potatoes, onions and carrots took less than an hour in pressure mode. The roast had not completely thawed out before cooking, so it was a little more rare in the middle than I would have liked, but I was able to carve off enough to satisfy my wife who prefers her meat well-done. The vegetables were done perfectly. Air fried french fries: 35 minutes in standard mode. As I pointed out earlier in this article, the rotation of the rotisserie basket resulted in the potatoes breaking as they tumbled against the rotisserie rod. Despite that, the fries were delicious, though I should have let them cook for another five minutes so they could crisp up more. Shorter fries might better resist breakage. Thinner-cut fries would cook faster and crisp up sooner. Shorter cooking time means fewer rotations of the basket and, hopefully, less breakage. I need to experiment some more to find that sweet spot, but my daughter was a raving fan. Rotisserie Chicken: A whole chicken took only 40 minutes in pressure mode. The result was incredible, golden brown, fall-off-the-bone succulent perfection. Forty minutes. Baked chicken breasts take almost that long in a regular oven. The Novo Pro oven heats up to 450 in about 7 minutes and can cook a meal in a fraction of the time it would take in a regular full-size oven. So far, I have been thrilled with the results. Toaster ovens run around $150. Pressure cookers run between $100 and $200 or more. That adds up to about the cost of the Wolfgang Puck Novo Pro Pressure Oven. See how easy it is to justify the cost? Cost aside, the true value comes from how much we will use the appliance. It’s a little early at this point, but this is something I see myself using a few times a week. It’s not perfect and it may not be capable of doing everything as advertised (I’m talking turkey here, literally). But for me, at least, what it can do more than justifies the purchase. I have never been completely happy with the results when roasting beef under pressure and have returned to roasting them in our conventional oven. Roast vegetables and roast potatoes are excellent when cooked under pressure. Where this oven excels over anything else, though, is chicken, especially on the rotisserie. A rotisserie chicken, under pressure, takes about 40 minutes and tastes amazing. The oven is not inexpensive and it does occupy valuable counter top real estate, so I’m no longer sure that I can completely justify this purchase. However, based solely on the rotisserie chicken results, my wife and both insist that the Wolfgang Puck Pressure Oven is here to stay.